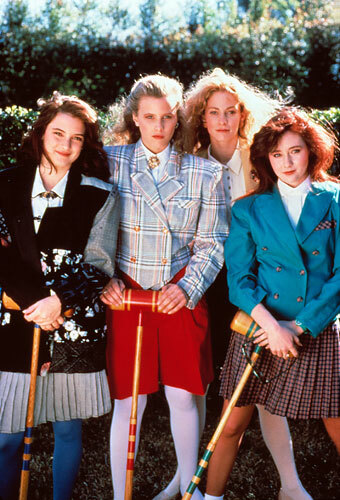 I know this probably sounds crazy to most of you, but I just saw Heathers for the first time. Perhaps it was because I was only 5 when it came out and the 80's were my baby youth. I love watching movies like this. You know, the high school 80's ones with the popular kids. That movie with Sarah Jessica Parker...what was it called? These movies to me are true archives of 80's fashion off the run-way. As someone who only takes a few style nods from this unforgettable decade, most of them are re-hashings of popular trends of the 1940's. Some of which are still relevant today. I like to say that those are classic "bodies" or a style idea that is timeless and will always look great, no matter what year it is. 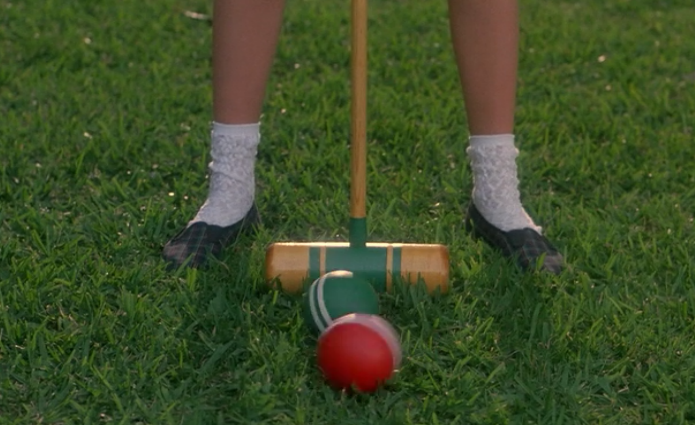 First thing I noticed in the styling of this movie is in the opening credit scene where the girls are playing the first of many games of croquet. 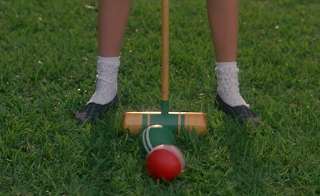 Each girls socks or an accent on their shoes match their croquet color. I also want to make a point to say that no adult should wear white tights. I don't care how thin you are, white tights will always make you look bigger than you are, and like a pre-pubescent. 2 snaps of Shannen Doherty's foot/ball coordinations. Adorable evergreen socks (they seem to have a cute detail on the heel) and in the top (a separate match) awesome lace socks with evergreen plaid slip-ons. Nice subtle choices that I noticed right away. 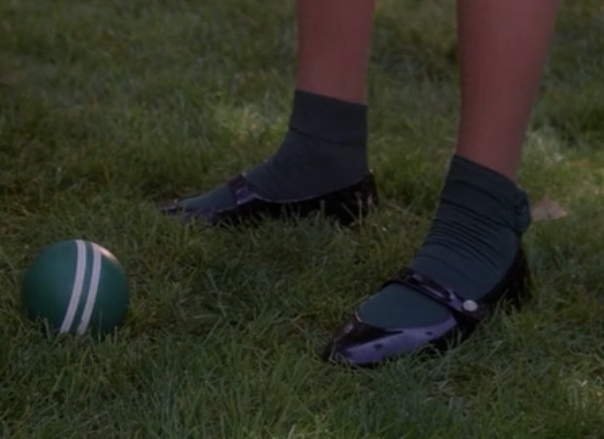 Little socks with mary janes or heels is kinda the way to go in Spring for me. It adds a nice extra feminine touch and can complete an outfit with little effort. I made a point to stock lots of cute little socks this spring. Another thing I noticed in the movie was the super high waisted circle skirts and high waisted pencil skirts with suspenders. I totally bought that exact black pencil skirt with suspenders ensemble Wynona is rocking a few years ago when I lived in Louisville. A style idolized and re-adapted from the 1940's and 50's that made a nice return in the 80's, 90's, and is much in the moment today. Nicely tailored, flattering pencil styles will always be around. These will always look good on a curvy female body and will ALWAYS make their wearer feel a little sexier. Circle skirts are another thing altogether. 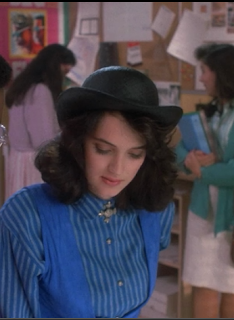 Wynona rocks this look perfectly, but lets not forget, she is pencil thin. When looking for the right pencil skirt you have to buy the right kind for your body type. If you have big hips or are a little bigger you want to accentuate your waist with a wider waist band and one without heavy pleating. Heavy pleating will make you look heavier at the bottom. Light draping on a softer fabric that can fall and hug your body is what you want. The pleating on Wynona's skirt is actual good for someone small or a little bigger. It's when you get into the cotton circle skirts with no waistline that you start to look round. No matter your size sometimes. I wanted to show you these outfits for very different reasons. Wynona's "shorts" suit and hat are utterly ridiculous. A true example of some BAD 80's fashion. And so interesting as it is so 1940's. The big shouldered double breasted jacket was all the rage for the "working" woman. Pants weren't common, but that's the bad 80's twist. I mean, big should pads in my book are always bad, 40's or 80's---whatever, don't do it. And that hat? It probably is vintage. I just like to see the transition from one era to the next. Heather looks pretty hot, I have to say. I could totally wear that today, AND I don't mind the fishtail...look familiar? This asymmetrical idea is all over everything right now. I don't like it most of the time, but here I think it is just great. I had to throw this one in here because I noticed that Wynona was rocking an enormous vest. I don't think it is done quite right (true to the 80's) but it has some merit and has me trying on my boyfriend's vests. I'll let you know what I figure out with this one. Something about this is ALL too 80's and fabulous. I love the shirt, that's easy. The brooch is definitely a Victorian throwback which I love---people are NOT rocking that look today, but I think it could be great this fall. This hat will always be in style, for men and women. Charlie Chaplin anyone? In theory I hate this vest, but in the time, it worked. I think though for it to be a flattering look that remains timeless it just needs to be tightened up a bit. Take the bottom part off of it (with all it's flaring pleat glory) and you've got a nice little number that slims that over-sized shirt right up. I would also dye it a darker color. 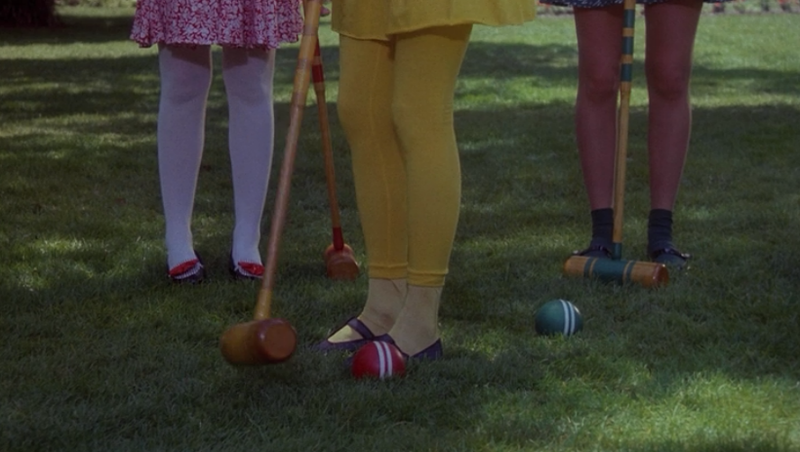 I like to think that whoever styled this movie made a conscious effort when putting Shannen in that striped bag and Heather in the striped shirt. It's the little things, I am telling you that I notice. I love everything that is happening aside from the layered "tutu" inspired skirt. Only really because I think they are mostly unflattering and super young, but it works for a movie about high school kids. I think I owned that skirt in high school. 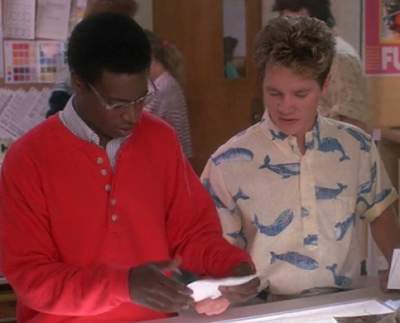 Also boys, there isn't a lot for you in this movie, but there is THIS scene right here. Hello whale shirt. And that striped oxford underneath that sweater henley is and will always be a winner. Drop these 2 in Brooklyn right now. Then there is the over-all styling of the film. I captured some of my favorite images to show you. 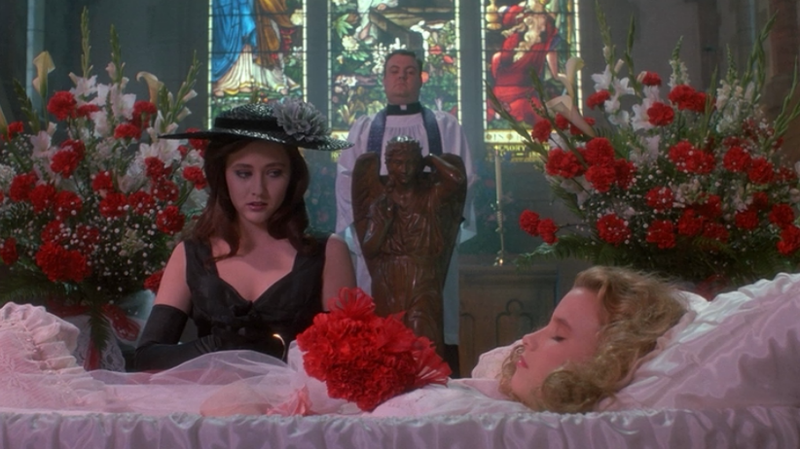 The funeral scenes, all meticulously shot and styled. The bedroom scene (you only see it for like 30 seconds) but the red striped wallpaper, the red ribbons on the comforter, and the red bow in the hair. 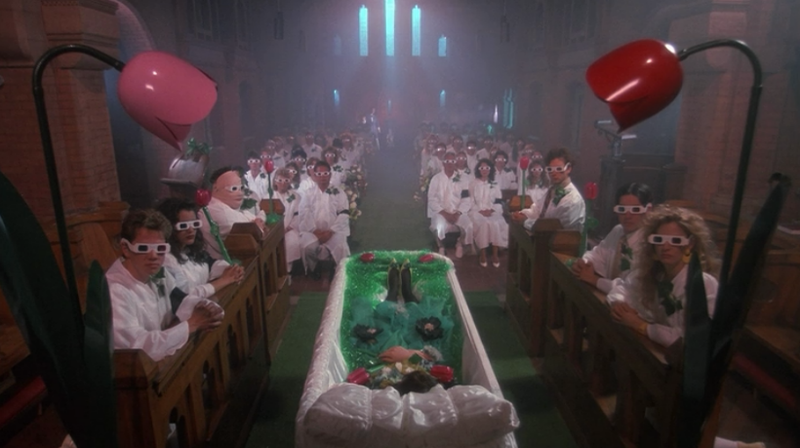 My 2 favorite scenes are at the end in her dream where she is at yet another funeral and everyone is wearing 3-D glasses. These scenes remind me of David Lynch. This outfit is totally bad hot topic goth but I love this shot. My second favorite scene is the very end when JD blows up and she stands there casually waiting for the explosion to light her cigarette. "I gotta MOTOR if I wanna be ready for that party tonight."